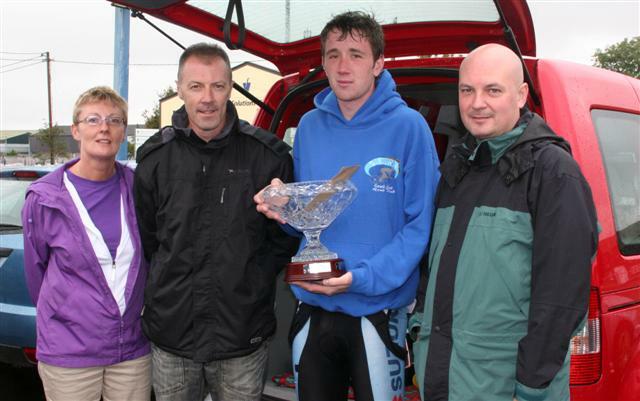 Catherine, Fergal and Eamon Redmond with race winner Cathal Redmond. Cathal Redmond of South East Road Club took the honours in todays Noel Redmond Memorial road race held on the extended Old Dublin Road circuit. Cathal narrowly pipped Co Champion Martin Mizgayski on the line for a hard earned victory having ridden hard in taking back the limit men on three minutes. It was a very exciting race. With attacks from the gun, Shane Kelly took a flyer on lap two only to be reeled in by the chasing bunch. Not to be outdone by junior it was Stevens turn next to get what looked like a winning break working nicely but the scratch group were having none of it and it came down to a bunch finish. The handicap worked well with both groups working well on the day. The novice section is coming up with some really strong riders. Slaneys’ Mylie Kavanagh and Hugh Byrne of Barrow Wheelers (who rode up from New Ross) kept the peleton at bay ’til the latter stages with Hugh finishing strongly in the main bunch. Unfortunately Hugh your novice days are over! Well done to Mylie on his first race, it only gets harder from here on! 1st Cathal Redmond SERC; 2nd Martin Mizgayski WW; 3rd Frank Dunne SCC; 4th Frank O’ Leary Bray Wheelers; 5th Conor Crowley WW; 6th Denis McCarthy M&G. U/Placed 3rd cat: Gianni Ponzi SCC; U/Placed Vet: Bill Jordan SCC, U/Placed Junior: Shane Kelly SCC, Novice: Hugh Byrne Barrow Wheelers. The Club would like to thank the Redmond family for their kind sponsorship towards the race and thanks to all the club members who assisted in stewarding in very wet conditions. Great to see Maire Ruth out and about again. We wish her a speedy recovery. 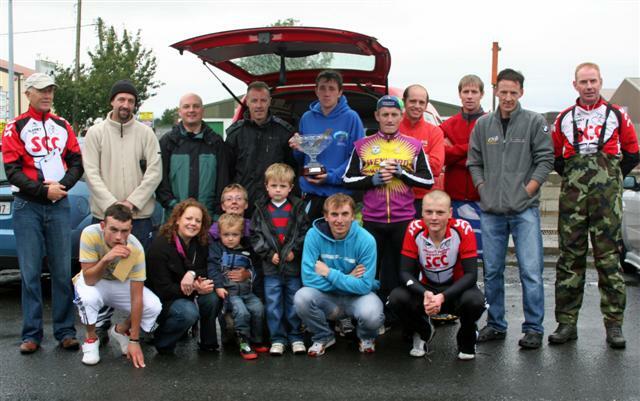 Previous Post:James Butler Memorial 5Mile TT.